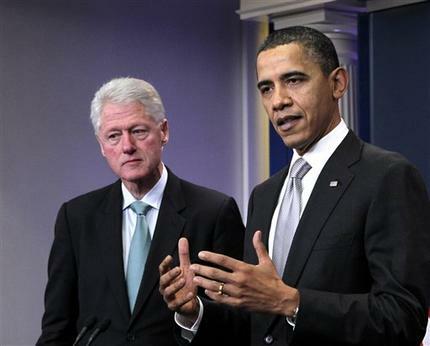 Manhattan, NY - President Barack Obama is getting a little help from former President Bill Clinton at a trio of campaign fundraisers in New York. The presidential duo will speak at a high-dollar fundraiser at a private home, headline a gala at the Waldorf-Astoria hotel and end the night at an event dubbed “Barack on Broadway” at the New Amsterdam Theatre. Monday’s trip is Obama’s first of two fundraising blitzes in New York in the coming weeks. He will return to Manhattan next week for a fundraiser at the home of actress Sarah Jessica Parker. Obama is seeking to persuade voters that he is still the right steward for the economy following a dismal jobs report out last week that showed an uptick in the unemployment rate. Clinton is doing this to better the chances for Hillary. Mighty courageous of you and your fellow grenade lobbers to post as "Anonymous" !!! I agree with #3; Clinton has lost a lot of weight and doesn't look healthy at all; on the other hand, Hillary has gained a lot of weight, recently. Regarding Obama's frequent fundraiser trips into Manhattan, Donald Trump has publicly blasted such trips. He stated that whenever Obama come into Manhattan, he inconveniences motorists, pedestrians, shoppers, tourists, residents, etc. I tend to agree with the Trump's analysis.